A while ago, Elizabeth and I were contacted by Special iApps to ask if we would review their apps. Even more generously, they are offering 2 of each of their apps as a giveaway here. I received a copy of the app for free, but the views are my own. Special iApps is a non-profit social enterprise set up by parents of children with SEN, and they have made a range of apps to support early learning and language. Elizabeth reviewed the Special Words app a few weeks ago. You can find out more about this app here and read the review here. 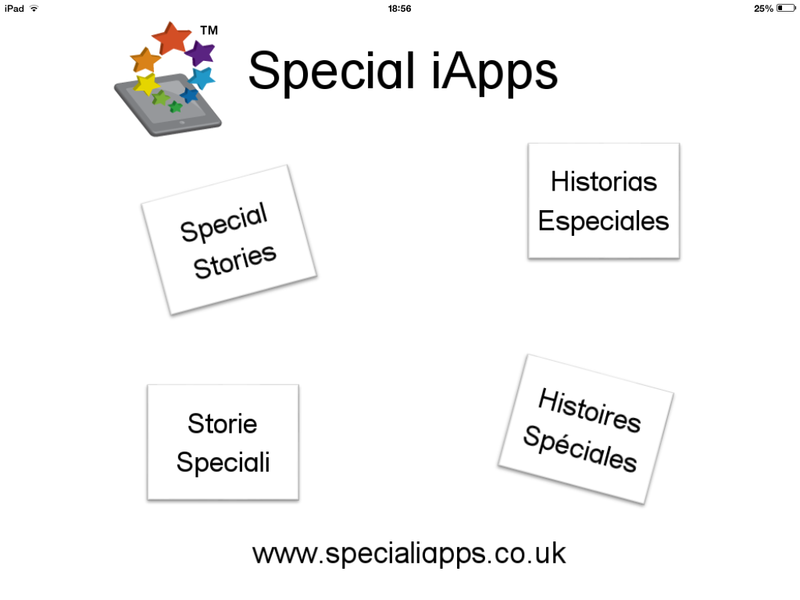 The app I’m going to talk about today is called Special Stories. This is a great versatile app that you can use to build simple photo stories. There’s a very simple guide which shows you exactly how it works, so it was really quick to work out how to use it. 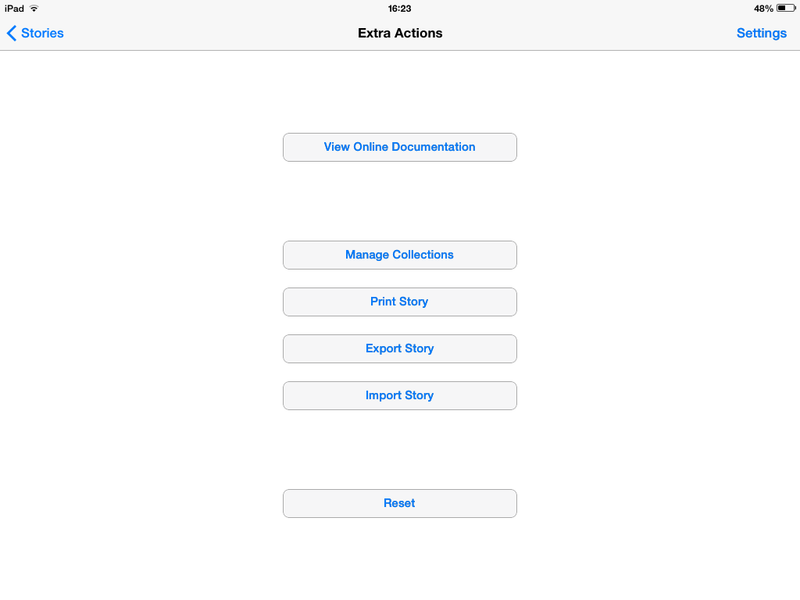 When you open the app up, it brings up a list of all the stories you’ve made so far that you can use or edit. When you want to build a new story you just click the + at the top and you can add a new story (or a new page to an existing story). You type in a title and then you can add any photo from your photo library or take one there and then. So if you’re using it out and about to make a record of a trip or want to use photos of a child’s favourite toy, you can do that. It is really quick to add a photo, just take it and click “use”. After you’ve confirmed the photo, you need to record sound to go with it. You can record any verbal message you like to go with the page – so you can just read the title aloud or put a different verbal message on. Once you’ve completed your page, just save it and move on to the next one. 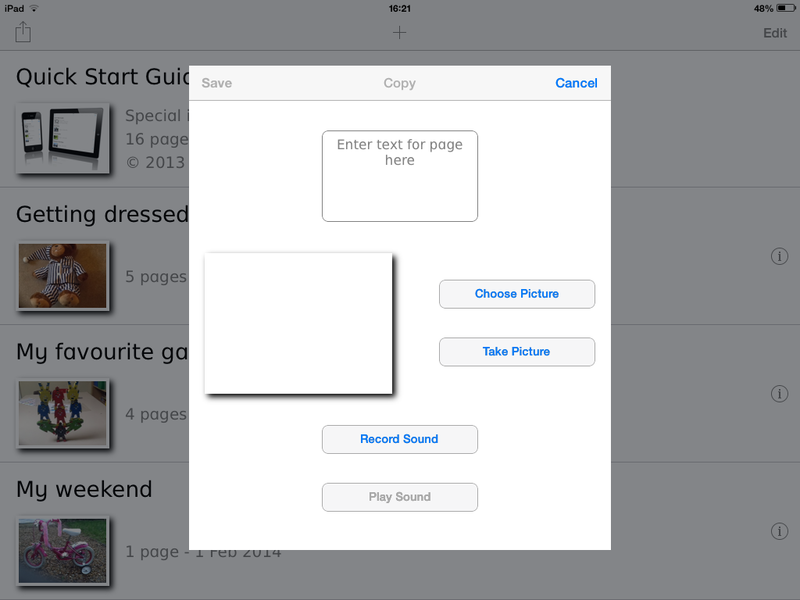 You can import and export stories to other devices with the app, which makes it great for sharing between home and school, for example. There are lots of settings you can alter – for example, you can automatically slide through the pages, or wait until someone clicks or taps the page to move on. You can lock editing so that it can’t accidentally be recorded over too if you want to. The only setting I’ve wanted to change and can’t (I don’t think) is to switch the voice off so that the child I’m working with can retell the story in their own words. However, this is easily solved by flicking the mute button on my iPad! It would be a great way for a child with limited speech to share news between home and school. They can make a photo story of their weekend or their day at school and share it with others. You could use it to make personalised social stories – take real life photos of the situation and it can be ready to go in a couple of minutes – no cutting or laminating required! You could also use it to make step by step instructions of how to complete a task. For example, I’ve made one to help a child remember the sequence of getting dressed. It would be great to use it to make a communication passport for a child with limited language who is going into a new situation. You could make pages about their likes and dislikes, how they communicate etc. As long as the child has the iPad, the communication passport is always there to be used. With the sound off, it would also be great to use with children who are putting simple sentences together to help them to retell stories or things that have happened. They could listen to the story they have made a few times, and then try telling it again. They could even record themselves describing each page. What other ideas can you think of? Do let us know how you have used this app or how you would like to. This app is currently priced at £9:99, which seems is a great price for such a versatile app. However, Special iApps have very kindly offered us 2 copies to giveaway. So if you would like a copy of this app, please leave a comment on this post. We will pick two winners next Monday (10th February). Hi. I would love to win a copy of this app. 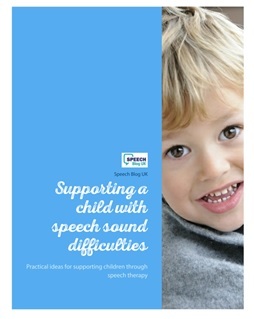 I love the special words app which I use with many of my speech therapy students. This app would be a great addition with many uses to suit a wide range of students. Thanks for the great reviews. Sounds like a great app – as a therapist specialising in Early Language I have encouraged parents to develop simple photo books with their children as a great way of encouraging joint attention. This app will make use of Smartphone and tablet technology to achieve that end. We have the app. 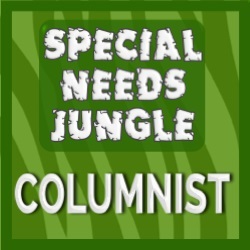 My daughter is 9 with SLD and severe communication difficulties. She can use the iPad and get on the app and use it no problem. We have made lots of books on it she can share with people. It’s so easy with an iPad either use your photo or image from the internet. Getting the story on is easy. We made a great story with all her relatives photos and them each saying good morning Izzy (their own voice). She then had to say good morning …………. We have done a few Speech and Language games with it. I would like to see folders as our list is very long and jumbled up. It would be nice to group them. This may be possible already but I just don’t know. We have used the print facility as well so she can take them to school. Hi Nannette, thanks for your comment and so glad you’ve found the app useful. I think you can actually arrange the stories into different collections in the settings – I saw information about it in the website yesterday, but haven’t needed to use it myself yet, so I’m not too sure how. Thanks for your ideas of how to use this app. With the start if the new teaching year, some of my students have found it a little difficult to settle back into school life, and it is resulting in angry outbursts and tantrums. I was only thinking that a class social story may be the way to approach it! This would be a perfect solution. With the start of the new school year, my students have returned and found some new routines a little too much too handle at this stage. This has resulted in angry outbursts and tantrums. I was only thinking that a class social story may be the way to go. This app would be the perfect solution. I love this app and bought it just last week. I am using it in parallel with DSE reading and language intervention program with my nearly 4 year old with DS. It allows me by simply and quickly to make and print her little personal books and then import the same picture to special words to teach the vocabulary in isolation. It’s fantastic. I have just applied for funding for my daughters preschool to buy them an iPad. They have a large number of children with Salt needs. And would love this app for them there. If people would like to see some research done on the apps Google Durham iPad project special iapps. I’d love to give this a go with Anna. She’s just got funding for a tablet, and uses PODD to communicate. It would be great to get her telling stories. We have randomly selected our winners! Drum roll……..
Kirsty and Sarah C – Congratulations! We have sent you both emails.